Edvard Munch’s “Scream” is one of the world’s most famous images – a socalled “iconic image”. It has appeared all over the world in all kinds of contexts and all kinds of editions from street-art and caricatures to The Simpsons and Andy Warhol. How could it be that there are several paintings by Edvard Munch called “Scream”? 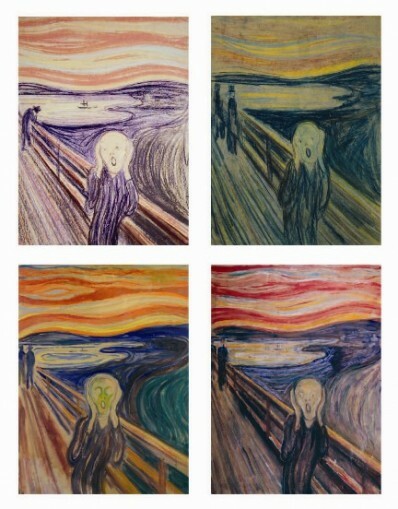 The original “Scream” exists in several versions: two painted versions, two pastels, a number of graphic works as well as drawings and sketches. The work now for sale, the pastel from 1895, is now to be sold at Sothebys in New York. The Sun was setting – the Sky turned blood-red. At eMunch.no you find this translated and shortened text which was written down by Munch himself and adapted to the frame of the 1895 pastel. The first time Munch wrote a poetic text that related directly to sketches leading to the “Scream”, was in Nice in 1891/1892 – see some of his first sketches here. The Munch Museum in Oslo owns the largest collection of Scream versions worldwide, including one oil-painting, one pastel/crayon, 5 graphic prints additional to drawings, sketches and prosa texts related to the development of the motif.